One is a trait. One is a method. We do Agile. We are agile. Unfortunately, the mere word “agile” has caught a case of "buzz-itis" recently, being invoked as some sort of panacea, differentiator or sales mechanism across industries. This article aims to shed some light on the difference between the agile organization (agility) and the Agile method – lower case “a” agile and upper case “A” Agile. The goal is to add clarity and raise the level of conversation occurring between and among change practitioners. Upper case “A” Agile is an iterative approach to software development and project management with articulated principles, values, methods, roles, processes and tools (check out the Agile Manifesto for the initial incarnation). By chunking down work, utilizing self-organizing teams and soliciting more rapid feedback, development and resulting outcomes are improved. The Agile Manifesto was written in 2001 by a group of software designers aiming to “uncover better ways of developing software.” The Agile Manifesto outlines four values and 12 principles that guide Agile development efforts. Upper case “A” Agile is something we do. Lower case "a" is who we are. Lower case “a” agile/agility puts our organization in a state where it can handle the velocity of change today and in the future in a manner that is effective and minimizes disruption, resulting in competitive advantage. Organizations are experiencing bigger, faster, more complex and more cross-functional change. At the same time, they are managing more information and are more connected than ever before. The internal triggers and external pressures for change are increasing at a rate that requires leading organizations to be better at change – to grow their organizational agility. Current research suggests that the amount of change expected is only going to increase in coming years. Agile is practiced by teams addressing specific issues or opportunities with a chartered initiative. It leverages self-organizing teams and roles like the scrum master, the product owner, technical experts, and end users. While Agile started in software development, it is increasingly being applied to non-IT changes, as evidenced in Prosci’s research. Lower case “a” agile/agility is demonstrated by each and every member of an organization as they “lean in” to change and demonstrate flexibility, durability and resilience. Various roles have unique responsibilities in an agile organization, but everyone plays a part. The effort to “grow our organizational agility” is often sponsored and spearheaded by senior executives working to make a strategic investment in the future of the organization. Agile methods can be put into practice quite quickly, so long as the team is adequately prepared and has effectively engaged the users who will be involved. Lower case “a” agile/agility takes time – in many cases years – to grow and nurture as part of the fabric of the organizational DNA and culture. Prosci provides direct support to leading organizations working to build agility by bringing a team together to define a future state, assess the current state and design a plan to navigate the transition state. How are Agile and agile Related? Upper case “A” Agile and lower case “a” agile are certainly related. As an organization launches, practices and grows its upper case “A” Agile approach, it can increase lower case “a” agility. Similarly, many organizations who are focusing on improving their lower case “a” agility have decided to employ upper case “A” Agile development approaches given the nature and desired outcome of the approach. However, they each can exist in the absence of the other. There are numerous organizations working diligently to increase their organizational agility but not employing Agile iterative development. Likewise, some organizations investing heavily in deploying Agile iterative development are not making a concerted effort to enhance their organizational agility. Agile and agile are different but are often found emerging together within organizations working to lay the foundation for more rapid and effective change. 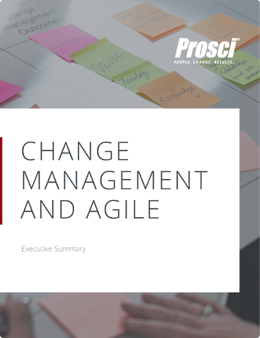 Applying change management in a project using Agile iterative development has been gaining prominence in recent years and is often a topic of interest at Prosci Change Management Certification Programs. At the end of 2016, Prosci launched a targeted benchmarking study to explore the people side of change of Agile. The research unpacked both how to adapt and adjust the practice of change management in a project using Agile iterative development and how to more effectively drive adoption and usage of Agile as a systemic approach to change. The findings from the research were released in a report in September 2017. While not the only part of an agile organization, an embedded change management capability is a critical enabler of agility in both Prosci’s work and many others. Prosci has over a dozen years of experience, research and development focused on building organizational change management capability. We provide clients with direct support as well as a suite including methodology, tools and role-based training for growing enterprise change capability. The velocity of change is continuing to increase, as organizations experience bigger, faster, more complex and more cross-functional change. At the same time, the demand to deliver expected results and outcomes continues to increase as well based on pressure by leadership, competitors, customers and the market. Both upper case “A” Agile and lower case “a” agile aim to equip organizations to more effectively respond to and seize opportunity. But they are different. Upper case “A” Agile is a method of approaching a particular initiative that originated in software development but has extended into other types of change. Lower case “a” agile is a trait marked by the ability to change more effectively and less painfully. By understanding the difference, practitioners can increase clarity and alignment around these pressing topics.